BMW automobiles are famous the world over for their elegance and luxury. The 2019 BMW X5 SUV, for example, reaches the heady power apex of 456 horsepower in its xDrive50i model option, while still maintaining the classic BMW style. A competing SUV, the 2019 Alfa Romeo Stelvio, has smoother design lines and a more tenacious engine, with 505 HP in is Quadrifoglio trim option. And at the base model level the 2019 Stelvio carries a starting price tag of $20,000 less MSRP than the 2019 BMW X5. The 2019 Alfa Romeo Stelvio is a surprisingly fast SUV, with a top speed of 176 MPH, all while leaving room in back for up to 56.5 cubic feet of cargo. Take your friends for a spin and update their expectations with the 2019 Stelvio’s top 0-60 time of 3.6 seconds, which easily tops the 2019 X5’s top 0-60 time of 4.6 seconds. The X5 also tops out at 155 MPH, a mild walk in the park compared to the 2019 Stelvio’s racetrack-level performance. On the inside, the 2019 Alfa Romeo Stelvio has plenty of available comforts, whether it’s available leather steering wheel, Alcantatra leather accents or 14-way leather front seats. It also is coming off a model year where the 2018 Stelvio made the Car and Driver 2018 Editors’ Choice list, an honor which the BMW X5 did not receive. When you also factor in the 2019 Stelvio’s edges in top speed, horsepower, 0-60 times and its design, which is graceful and unique, your choice in the SUV class is an easy one: Stelvio. 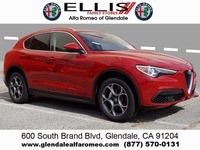 Test Drive a New Stelvio at Alfa Romeo of Glendale! Are you interested in a new Alfa Romeo Stelvio, and all the versatility and performance it provides? Then please visit us on the lot at Alfa Romeo of Glendale, 600 S. Brand Blvd., Glendale CA. We also serve the Los Angeles, Pasadena, Burbank, Van Nuys, Sherman Oaks, Woodland Hills and Thousand Oaks areas, among other local cities. Please call us at (818) 500-1750 or visit us on the lot so we can set you up with a test drive of one of these models on sale right now. Interested in a Alfa Romeo Stelvio?